The first and second phases were constructed between 1970 and 1977. The cranked shapes of the plans of the two towers at the edge of Lake Ontario presented a special wind analysis problem, which had to be solved, before the reinforced concrete slabs and shear walls of the structural could be designed. To minimize the shrinkage deformations of 450 feet long floor plates, the structure was separated by a temporary vertical contraction joint, located in the centre of the structure. The temporary contraction joint was connected after the structure was enclosed and heated. The lateral wind forces of the open lake exposure were sustained by employing concrete shear walls concentrated into four clusters of rigidity, which were investigated by employing a three-dimensional computer model. Reinforced concrete caissons, with permanent steel liners socketed into bedrock, below the surface level of the lake, had to be installed to support the apartment building. 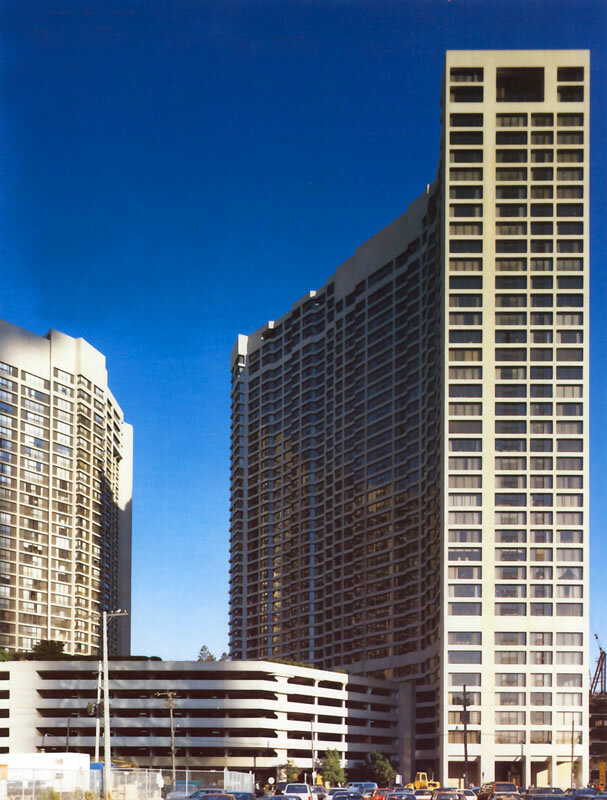 The multi leveled parking garage between the two residential towers incorporated the first use of deep modified drop panels, to support large areas of a structure, in the Toronto area.